November 17, 2018 will be a day like no other. Scottish Rite Day in Indiana will be celebrated with an All-Indiana 32° Reunion at the beautiful Scottish Rite Cathedral in Indianapolis. A full day of degrees is scheduled and will conclude with the 32° at 3:00 PM. Following the degree, a reception and banquet will be held honoring those who concluded their journey to 32° Freemasonry! This day will be historic. 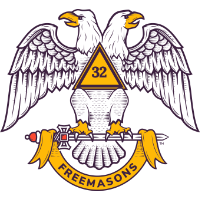 For the first time, cast members from the six (6) Indiana Valleys will gather to celebrate Scottish Rite Freemasonry and confer the 32°. The Valley of Indianapolis will also be conferring the 4°, 14°, 15°, and 18° for those candidates who were not able to begin their Scottish Rite Journey prior to this joint conferral. This will truly be a day to remember, so don’t miss it! Your spouse, or significant other, is encouraged to attend. From 3:00 p.m. to 5:00 p.m. they will enjoy a wine and cheese reception. Guided tours of the Cathedral will also be available during this time. After the 32°, there will be a reception, followed by the banquet. We need to know who is coming in order to adequately prepare for the day’s activities . Please register using the appropriate button below. You will receive your meal tickets at the registration table on the 17th. I look forward to seeing you in Indianapolis!